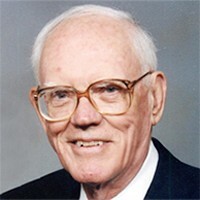 Covey, Kenneth W. MD died June 28, 2016 in Moorhead, MN. He was almost 97. He had been in failing health since the death of his wife, Grace in 2012. Ken grew up in Bagley, MN. His father was a dentist and his mother rescued animals and fed hobos during the Depression, influencing Ken's lifelong desire to care for others. His love of science and fascination with amateur radio also began early. Ken earned a HAM license (WØZQJ) at 16 and maintained that interest and license until his death. He was a 1943 graduate of the University of Minnesota Medical School entering after his junior year at Hamline College. After completing his internship, he began a general practice in Mahnomen, MN, where he was the only physician in the county. He worked with Benedictine nuns to provide care to rural residents and White Earth band members, developing a paging system for house calls that would honk his car horn when activated by the sisters using a 2-way radio. His children often rode along with him on house calls to be near him. After 11 years of practice, he began a fellowship in Orthopedic Surgery at Mayo Clinic, Rochester. He practiced orthopedic surgery in Crookston and later in Moorhead. He established free clinics for Mexican-American migrants who worked in the beet fields of the Red River Valley, donated his time to free clinics for children with orthopedic problems, and established health clinics for homeless people in Fargo and Moorhead. He was an active volunteer in those clinics and at the Dorothy Day House in Moorhead. He received the Harold S. Diehl Award by the U of MN Medical Alumni, and shared a McKnight Human Service Award with his wife. He gave selflessly and without expectation of reward, including donating one of two burial plots he and his wife owned so that a well-loved homeless man could have a final resting place. Ken loved to bicycle and was frequently seen in a suit and tie biking between hospitals and his office, no matter the weather. He rode on many of Jim Klobuchar's trips, where he was known as "Doc." He had a quirky sense of style, which included biking in wing-tip shoes and having a rubber duck glued to his helmet. In later years he took up the recumbent bike and at age 85 was still averaging 3,000 miles a year. He and his son also completed the Rag Brae and many fund-raising rides. He is survived by his children: Catherine Covey, Elizabeth Swee, Jane Hovland, Christine Day, and Mark Covey, his grandchildren, great-grandchildren and numerous nieces and nephews. His legacy is the commitment his family has made to others through healthcare, education, and volunteering. Prayer Service Tuesday, July 12, 7 pm, Korsmo Funeral Home, Moorhead; Funeral Service Wednesday, July 13, 11 am, First Presbyterian Church, Moorhead. Memorials preferred to an organization serving the homeless.